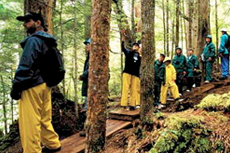 A rainforest hike in Ketchikan is a great way to get active outdoors—and admire the flora and fauna that makes Alaska so memorable. Went to the Raiinforest Sanctuary Preserve. Billed as Family Rainforest Adventure. Billed as Family Rainforest Adventure. Nothing of an adventure. WAY overpriced at $250.00 for about a 2 mile drive in an electric cart and a couple pancakes and marshmallows. AVOID at all costs. Great experience in the rain forest. This was rated as an easy walk....not true. This was rated as an easy walk....not true. Was a lot of up and down. We were lucky and it wasn&apos;t raining. We hopped in a small boat (a RIB) and went to an island for a hike through the rain forest. We hopped in a small boat (a RIB) and went to an island for a hike through the rain forest. The national parks have the hiked planked to preserve the area, but there were plenty of stairs, so mobility is good. Tom was our guide for the hike as well and again, he did a great job teaching us many things about the plants and trees as well as the area. Took a boat out to an island, and hiked in the rainforest. Took a boat out to an island, and hiked in the rainforest. Really great experience. Excellent easy hike through rain forest with a wonderful guide full of knowledge and humor. Excellent easy hike through rain forest with a wonderful guide full of knowledge and humor. Saw a bear up close and several eagles. Gorgeous and informative. The Rain Forest was fun and we saw a black bear and her cubs. The Rain Forest was fun and we saw a black bear and her cubs. The raptor center was outstanding with Sitka the eagle and Jake the hawk. Spectacular pictures of the eagle. And the totem carving was educational. Fortunately, the weather was fantastic! The guides were very good and made an effort to be personable and knowledgeable. The guides were very good and made an effort to be personable and knowledgeable. The sites were interesting and fun. The hike is less than a mile, less than 200 feet incline on board walkway...not so much a hike as an amble. The Orca Cruise portion was just the boat ride there and back...misrepresentation. The tour was well organized. The tour was well organized. The Flora was beautiful. The only disappointment was not being able to see the fauna we had hoped to see. For our group it was a great experience because we saw a bear, eagles, and spawning salmon. For our group it was a great experience because we saw a bear, eagles, and spawning salmon. However the two groups before us only saw the eagles. Not really very exciting if you don&apos;t see any wildlife. Again, barely visited the town and took a small boat out to Betton Island for a nature walk. We lOVED the seahawk ride. This was one of the highlights of the cruise experience.